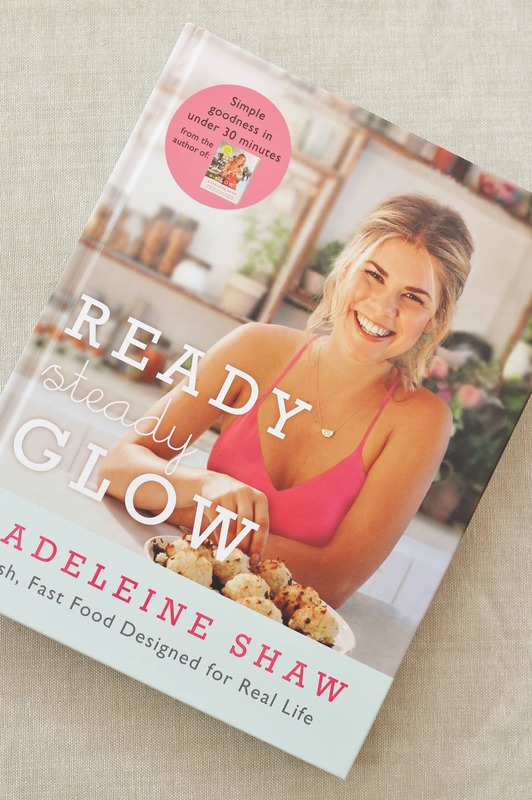 Madeleine Shaw’s Second book Ready Steady Glow is a wonderful collection of easy, healthy and delicious recipes to help you get that glow! 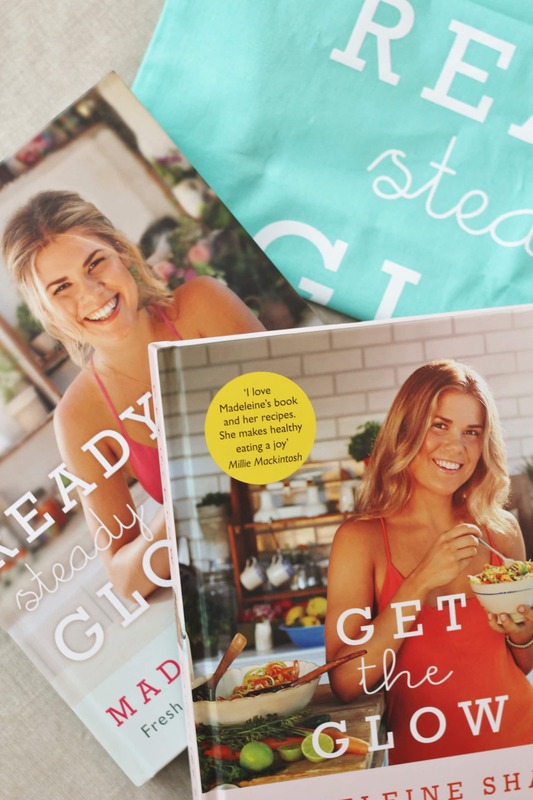 Regular readers of this blog will know that a few weeks ago I won signed copies of both of Madeleine Shaw’s fabulous books: Get the Glow and Ready Steady Glow. Last week I reviewed Get the Glow and also shared two of my favourite recipes: Indian Spiced Cauliflower Rice and Gluten Free peach and Cherry Crumble. This week I am reviewing Madeleine’s latest book Ready Steady Glow. 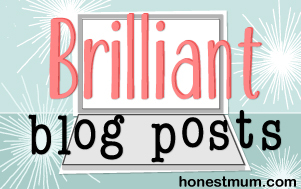 For those of you who aren’t familiar with Madeleine Shaw or didn’t read my first review (why not? Go and read it now! 😉 ), Madeleine is a qualified nutritionist, health coach and wellness blogger who is on a mission to spread her healthy eating message. She is passionate about eating well and living well – not just to lose weight, but also to look good on the outside and feel good on the inside. In her second book Madeleine wants to do away with the myth that nourishing your body takes lots of time and effort and seeks to make healthy eating even easier, by providing lots of simple and quick recipes, which can be made on a busy weeknight – definitely my kind of recipe book! Madeleine starts off Ready Steady Glow with a fabulous introductory section where she walks the reader through a typical week in her life and shows how she manages to fit healthy eating and regular exercise in what must be a pretty hectic and busy life. Top tips from this section include: start the day with exercise, plan and shop for meals on a Saturday, batch cook for the week ahead on a Sunday and always make an extra portion of dinner to take to work the next day for lunch. She also gives advice about what to do if you forget your healthy lunch, what to do when you are invited to a dinner party, but don’t want to compromise on your healthy eating regime and how to eat healthily in restaurants. One of Madeleine’s top tips for healthier eating is to give your store cupboard a spring clean and fill it with healthy food. This is great advice. I strongly believe that healthy eating starts with healthy shopping! If you buy healthy food it is much easier to eat healthily than if your cupboards are full of unhealthy food. Madeleine’s suggestions for a store cupboard essentials include lots of normal, sensible things like nuts, seeds, quinoa, beans, oats, spices, dried fruit and healthy oils as well as a few more unusual things like coconut sugar, tamari and buckwheat flour. She then goes on to share some general nutritional advice, such as balanced eating and portion size: Madeleine prefers to focus on sensible portion sizes rather than rigid calorie counting. She also shares her tips on healthy snacks, how to stay motivated, how to fit exercise into a busy life and how to get your loved ones involved. The rest of the book is divided into two main sections Fast and Slow. In Fast, Madeleine shares recipes for breakfast, lunch, dinner and snacks that are perfect for busy weeks when there isn’t much time to cook. 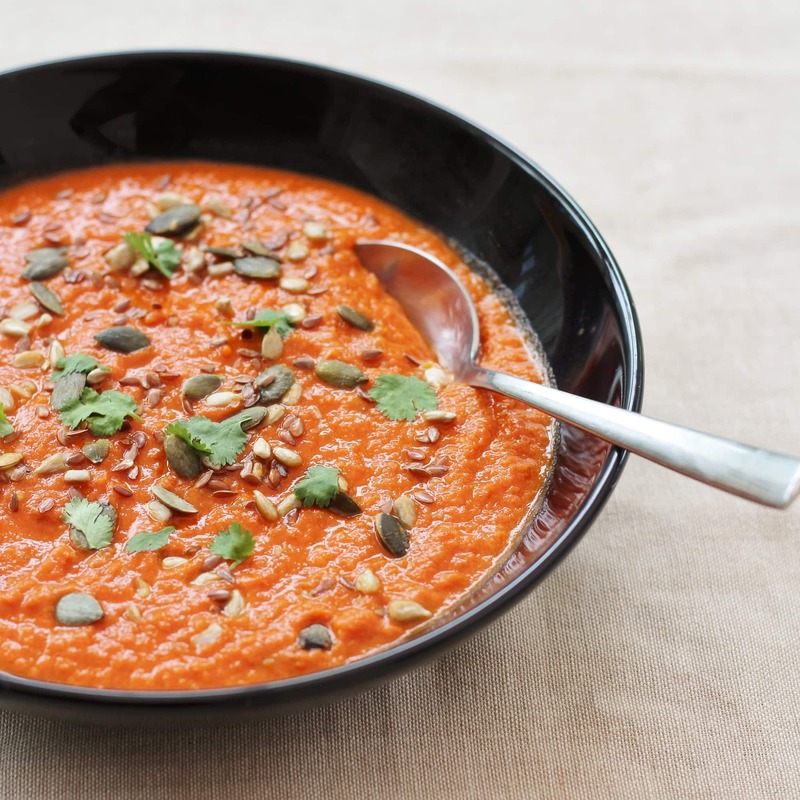 Every recipe includes a time guide to help you know how long it will take to make and none of the recipes in this section take more than 30 minutes, some as little as 5, such as her life changing spicy tomato soup. In Slow. Madeleine shares the kind of recipes she likes to make when she has a little more time to spare – maybe at the weekend or on slower days. These include, lazy brunches, show stopping mains and sides and delicious desserts. In her final section, Madeleine shares a couple of meal plans: a meat/fish one and a vegetarian one – great for taking the stress out of meal planning! And she also shares an easy 15 minute yoga routine which she suggests doing in the morning before breakfast to start the day on the right foot. I love the way this book is divided up – it’s great to know which section to turn to depending on whether I want a quick midweek supper or a show-stopping main for a dinner party and her helpful tips and advice are so useful and delivered in the same warm, encouraging style as her first book. Just like her first book, this book is full of easy to follow recipes with the added benefit of a time guide for her ‘fast’ recipes. I would still have liked to see numbered steps and timings for all recipes, though and I also found some of the timings for her ‘fast’ recipes were a bit ambitious. 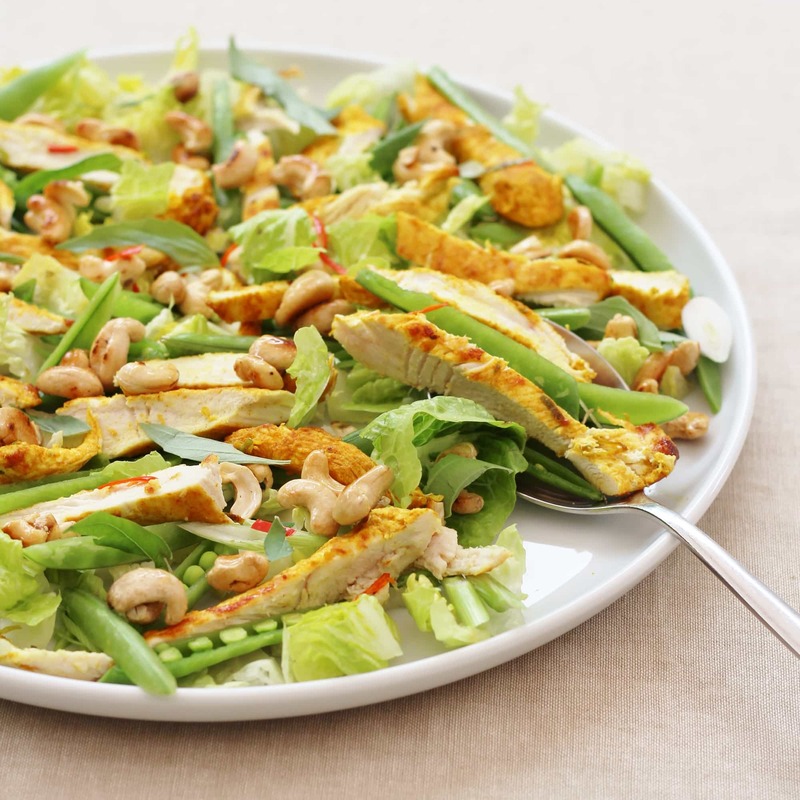 For example her Thai Chicken Salad says it should take 15 minutes but took me over half an hour from start to finish…and I’m not a slow cook – If my husband had made it, it would have probably taken him an hour! All the recipes feature a lovely inspiring photograph of what the final dish should look like, as well as a little blurb at the top. I love how this little blurb often tells you something about why the dish is especially good for you. In fact, if anything, I wish there was more nutritional information about the recipes and ingredients she uses. This was the first recipe we tried and quite possibly our favourite of the lot. 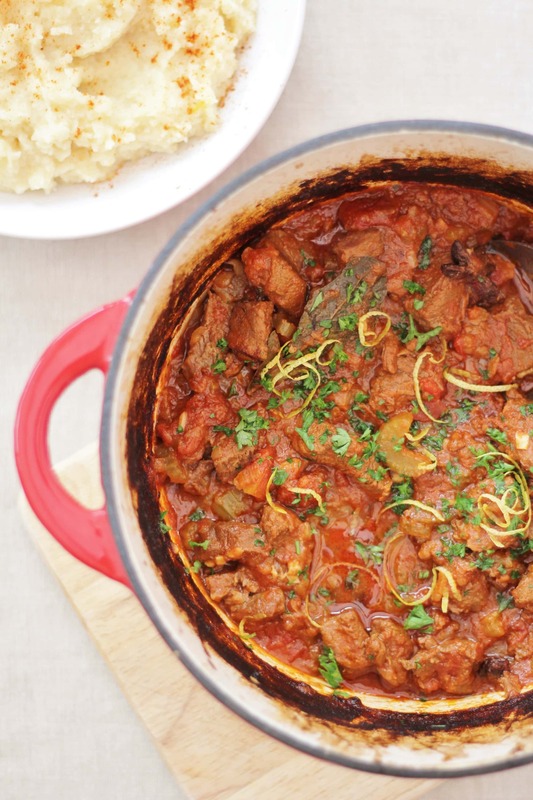 A delightfully simple and totally delicious lamb curry. It’s in the ‘Slow’ section because it takes about 2 hours to make, but actually only about 20 minutes of that is hands on time – the rest of the time the curry is in on the hob chuntering away, doing its thing! 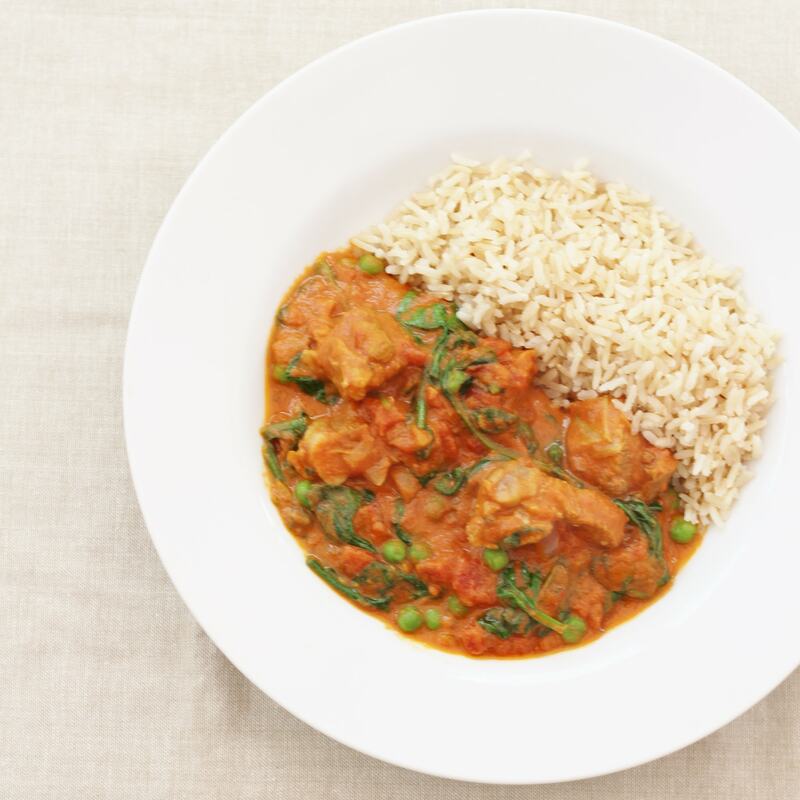 The curry is served with brown rice – which I love! 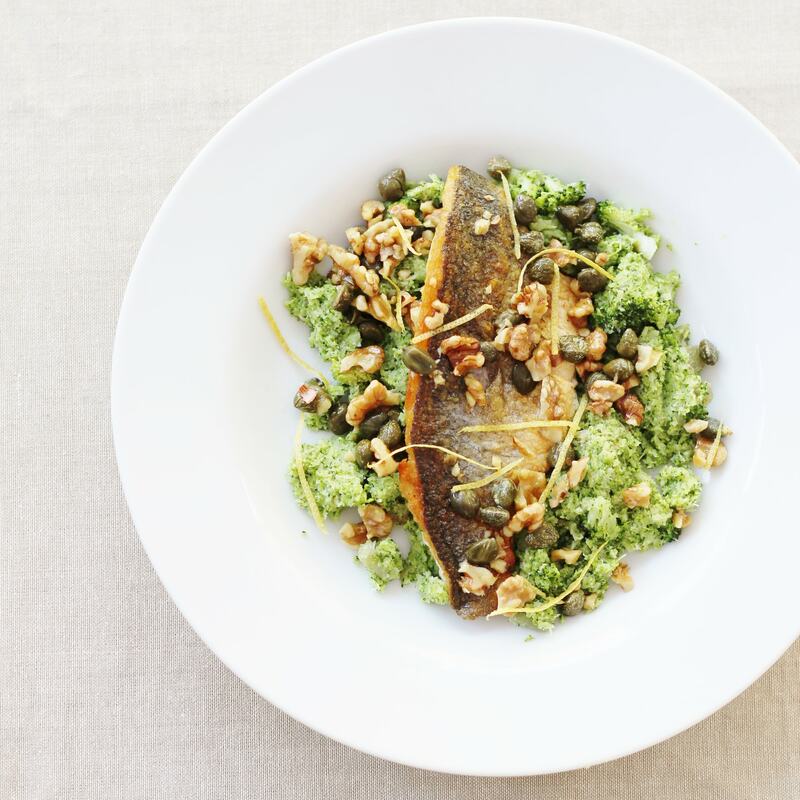 But would go equally well with Madeleine’s Indian Spiced Cauliflower Rice. This salad is awesome and so simple to make – the only thing is, it definitely does take a little longer to make than the recipe suggests – I added in some avocado for some extra goodness and to make it a little more filling. I also added a drizzle of honey to the nuts to make them taste extra fabulous! I was amazed how much the kids liked this one…they happily ate it all AND came back for seconds! This was probably my least favourite recipe of the lot – don’t get me wrong – it was a nice enough beef stew, but it wasn’t amazing – mostly because I found the flavours a bit confusing – celery and thyme are nice flavours for a beef stew, as are star anise and cinnamon, but not all together – or at least not in my head! 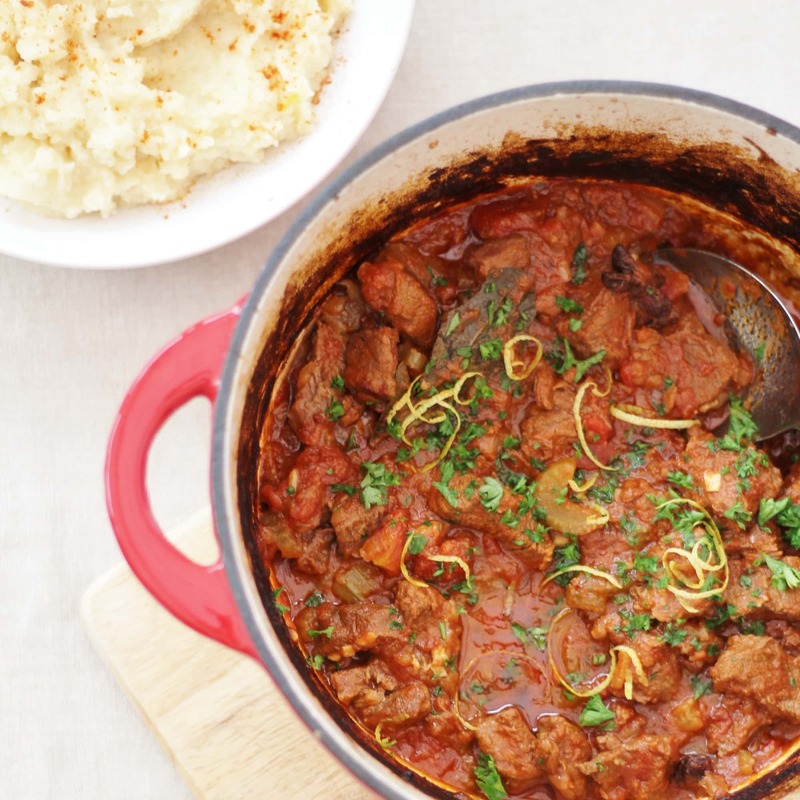 I couldn’t get hold of beef cheeks, so I used stewing steak instead and cut the cooking time down to 2.5 hours in the oven, which worked brilliantly and made the whole thing quicker and easier – especially as I don’t have a slow cooker. We all liked the idea of celeriac and parsnip mash which makes for a lovely light alternative to mashed potato – and is a similar colour – it totally fooled my kids…and my father in law, who all thought it was regular potato mash until I told them! 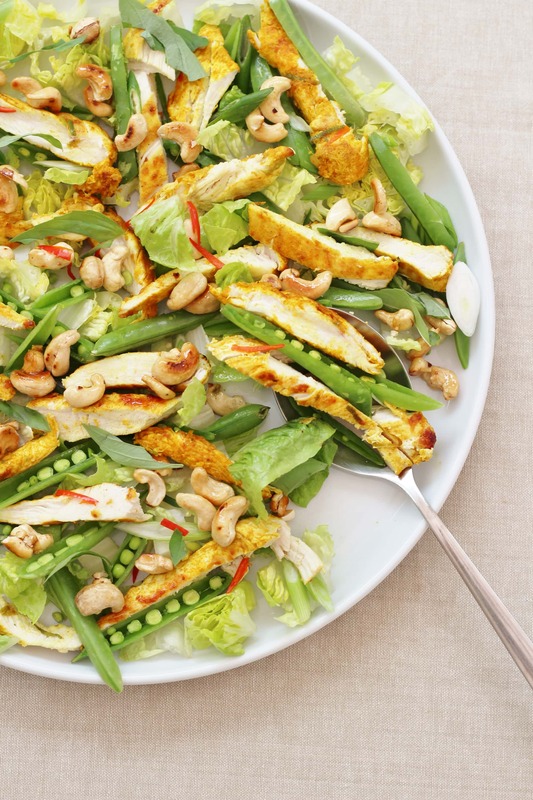 Oh my goodness – this salad is AMAZING! It sounds like a bit of an odd combination, but it isn’t. These ingredients really work together and it is super fresh and jam packed full of goodness – I literally felt amazing after eating it. And it is weirdly filling. 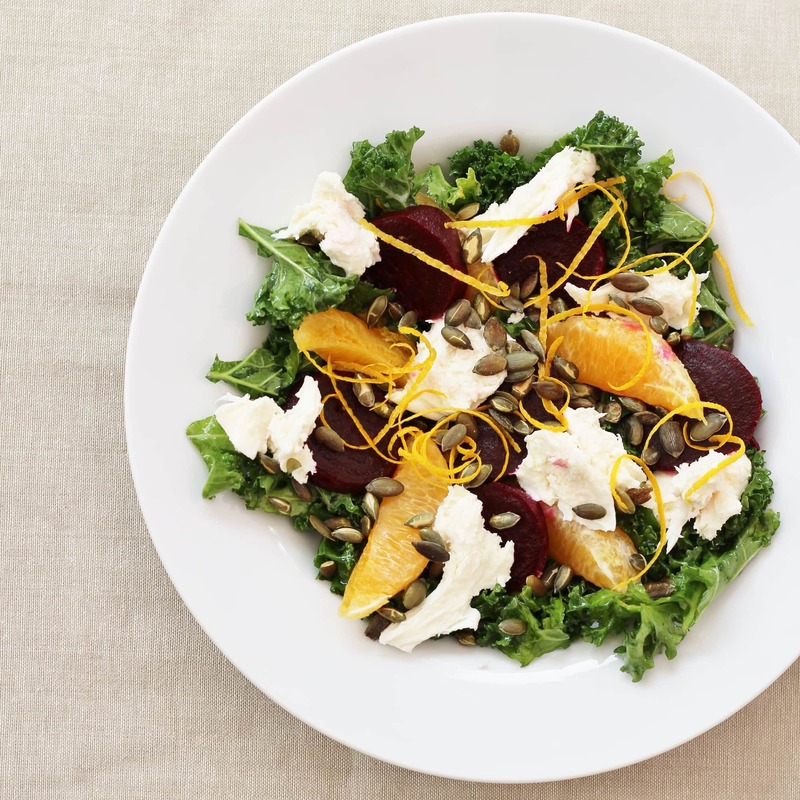 I sort of looked at it and thought – beetroot, kale, orange and mozzarella and a few pumpkin seeds…that’s not going to fill me up…but it totally did – I couldn’t finish it, in fact! Actually I’ve thought that a lot about Madeleine’s recipes – sometimes they really don’t look like they will fill me up – but they do, really well! I’m never hungry after eating her meals! Another fab meal. Apparently broccoli is the new cauliflower when it comes to mash. And I love how pretty this meal looks. I made sweet potato chips to go with this, as I didn’t think it would be enough food…and I was wrong – again! I could only eat about 3 chips as the seabass and broccoli really filled me up. 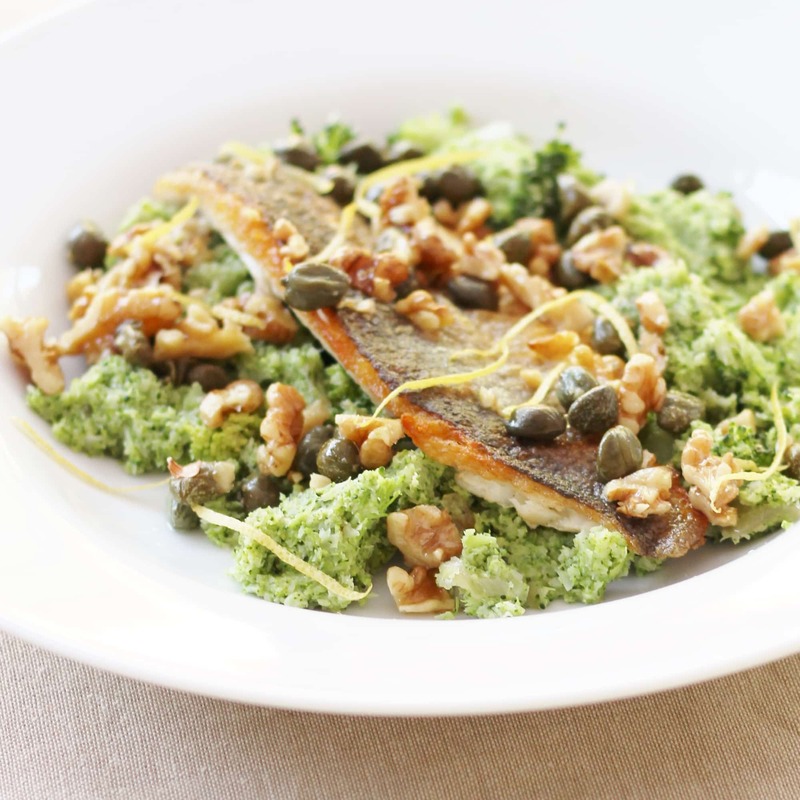 The only thing I would say about this one is I really think it could have done with some lemon juice squeezed over the top, just to perk it up a bit and, while I enjoyed the broccoli mash, I did miss the texture of broccoli. I think another time I will just cut it up small and pan fry it with the walnuts and capers – which will make the whole dish a bit easier to do too. 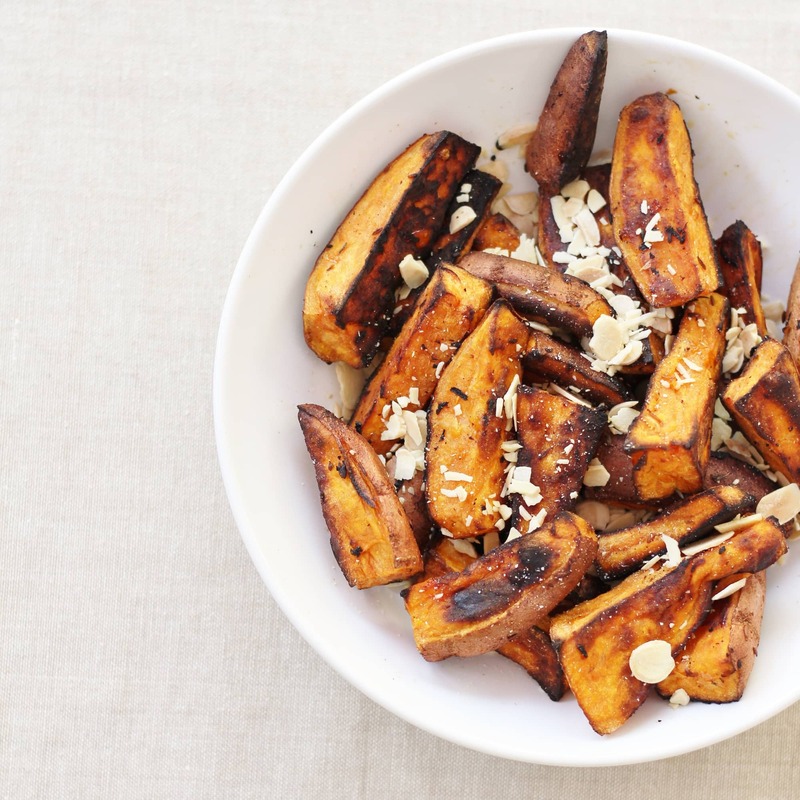 I love a good sweet potato chip / fry and Madeleine uses some amazing flavours on these…cumin, chilli, lemon, thyme, garlic…but she suggests cooking them for 45-50 minutes and doesn’t suggest turning them. Now, when I do sweet potato chips, I cook them for 20 minutes, turning once. Against my better judgement, I left these chips in the oven for 20 minutes before checking them and they were already quite blackened on the bottom. I did them for an extra 10 minutes and then removed them before the same happened on the other side – I hate to think what would have happened if I had left them in the oven for 50 minutes! They tasted fine, though – just a bit on the charred side! Porridge in summer? Whatever next? In her blurb Madeleine suggests that this porridge would really work in summer because of the tropical flavours from the lime and coconut. And do you know what? 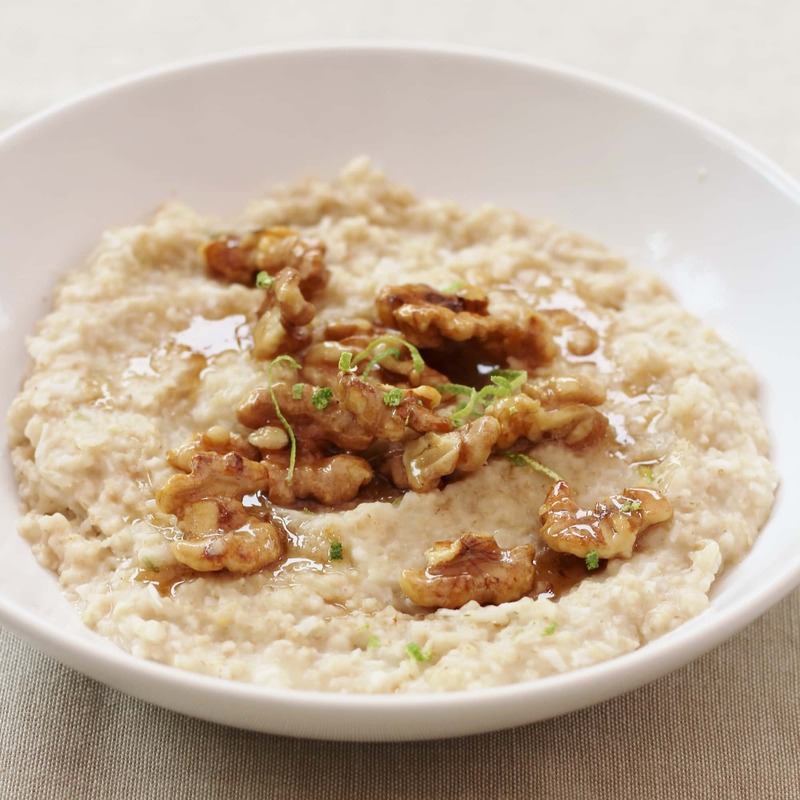 It really does (especially the summer we’re having in Britain this year) – it’s a great version of porridge – the lime, vanilla and coconut are fab additions and I loved the honey and nut crumble on top – I would have happily had more of that! The only thing I would say is, because I used oats rather than quinoa flakes (the recipe gives both options), I needed a lot more milk than the recipe stated – about twice as much! But I was using Rude Health‘s lovely almond milk, so it was no great hardship! I had so much fun making these – and they are super easy to make. Just soak dried mango and then blitz with desiccated coconut, lime and ginger (I used my trusty hand held blender – worked fine). 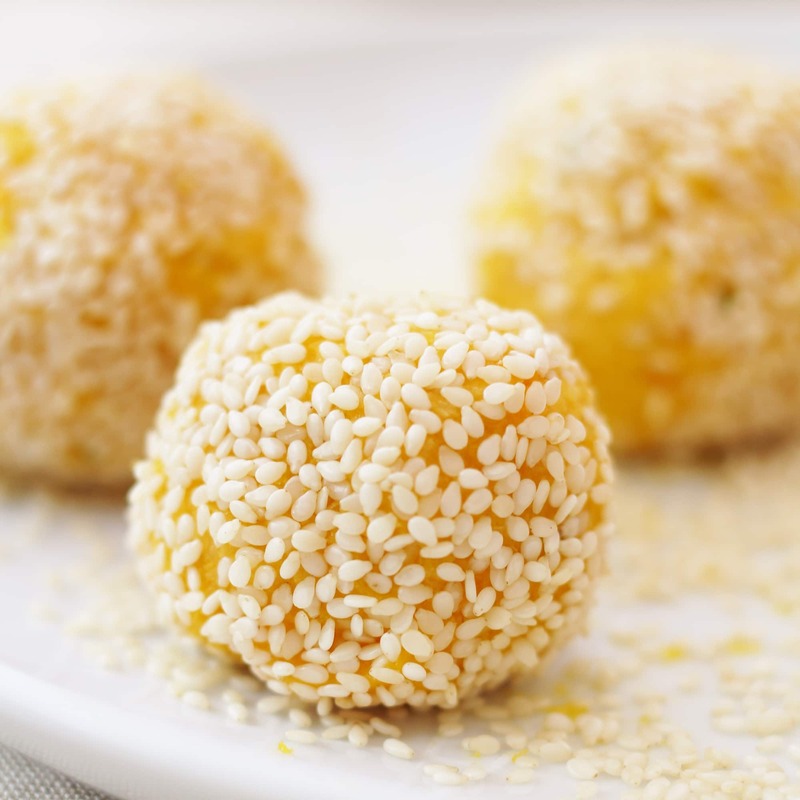 After that you just shape into balls and roll in sesame seeds and they are done. Simples! Oh and they taste amazing…except weirdly my kids didn’t like them. Oh well – more for me! This book is a great book for anyone who wants to improve the way they eat. There is not much I can add that I haven’t already said in my review of Get the Glow – basically, if you like Get the Glow, you will like this book. As with Get the Glow, it is particularly good if you need your meals to be gluten and sugar free, and also quite good for vegetarians and dairy free people, though not brilliant if you need your food to be nut free – Madeleine uses a lot of nuts! Like her previous book, Madeleine does use gadgets quite a bit, but mostly this can be got round by using a stick blender or chopping finely. And, also like her previous book, Madeleine uses quite a few unusual ingredients, so if you, or those who you are catering for, are not a fan of quinoa, chia seeds and kale, this might not be the book for you. 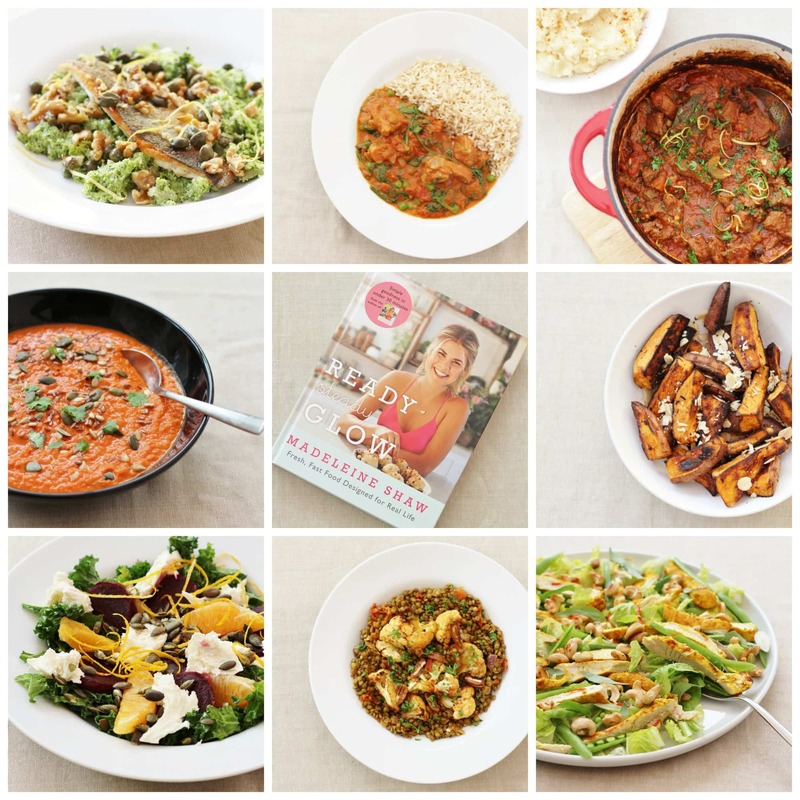 This book really builds on Get the Glow, giving you lots more lovely recipes that follow Madeleine’s healthy eating principles, including a whole swathe of quick and easy ones and in addition a couple of really useful extra sections and advice. If you loved the first book you will love this one even more! What are you waiting for? This is a fab book…buy it now! P.S. Enjoyed reading my review of Ready Steady Glow? Why not check out all my other reviews?